Non beer drinkers and caffeine fans rejoice: Foamee now has support for coffee. Just follow @ioucoffee on Twitter and follow the same steps that 1600 beer aficionados have followed over the past few weeks. @ioucoffee @twitterscreenname for being an amazing human being. Then keep track of those I.O.U.s (for beer and coffee!) on your people page (here’s mine). Send beer. Send coffee. Send good vibes to all the interweb’s citizens. Happy Holidays from your friends at SimpleBits. Last week, I gave my More “Wow”, Please talk at Web Design World Boston. During the talk I mentioned a fantastic book: Let My People Go Surfing by Yvon Chouinard. Yvon founded the expensive-but-awesome clothing company, Patagonia. I’ve long been a fan of Patagonia’s stuff, and their dedication as a company to environmental causes (they co-founded One Percent For The Planet, of which SimpleBits is a member) , and so when Josh Porter recommended the book a while back, I ordered immediately. The book covers the history of the company, Yvon’s philosophy on design, and being a reluctant business owner. It’s a great read, with a lot of insightful head-nodding. I didn’t know it before reading that quote, but I think I’m an 80 percenter as well. For people that love to create things, whether it be a website or a t-shirt or even a beer coaster (ahem) — the web seems to tie all these things together quite nicely. And it’s reaching 80% proficiency (but not 100%) that I think makes it possible to handle all of that at one time. Ever try talking to (or working with) someone who is 100% obsessed with a single task? The danger is that they’ll get bogged down in details. Every detail. Whereas an 80 percenter might eventually learn to know which details to focus on. And determining which details are important can be just as useful as knowing them all. At least that’s my interpretation. Regardless, I recommend the book highly. It’s been a few days since the keg was tapped and Foamee began serving the public. Things went as smooth as one could hope, and about 500 Twitterers have sent some 700 I.O.U.s. (35 of which have been redeemed). We were honored to have collected the Mashup of the Day Award on Monday (which begs the question: are there enough mashups being developed to warrant that? I suppose they’re are). But more importantly, I’m glad that Foamee is being used for what I hoped it would: spreading some good vibes around the interwebs. You can (and should!) use Foamee to keep track actual, physical beers of course, but it can also simply be a way to send a little virtual good cheer that’s free and easy. for helping jake and i make it to our first springsteen concert last night! for telling me your story last night. for growing one heck of a goatee. And while you’re at it, why not send a beer to your dog? Pets deserve some Foamee, too. I think I’ve just created something that will change the web as we know it. But I’ll write about that another day. Instead, I’m going to talk about a fun new thing I launched last night. Actually, it’s a couple of things. I say this quite a bit. For friends, family, people that deserve a pat on the back. I also often forget to make good on the promise. Wouldn’t it be cool if there was a way to keep track? And then also keep track of who owed you? So, I decided to build Foamee (hey, there were plenty of abandoned ‘e’s lying around). It’ll keep track of who you owe beers to and vice versa. But don’t worry, this is NASN (not another socical network). Like you, I’m tired of creating another login, another set of friends/contacts, another avatar and more tears. So instead, Foamee piggy-backs on an existing one. As I was tossing ideas around, I realized a lot of the functionality: short messages directed at another person, web/IM/mobile messaging, etc. already existed elsewhere — so why not make things simpler and utilize the indispensable Twitter as a primary interface for the app? Using Twitter’s API, Foamee will harvest replies and direct messages to create a barnacle-esque utility (props to Josh Porter for coining that) on the already-popular messaging service. If you’re already on Twitter, using Fomee is as easy as following ioubeer, then using specific syntax to announce an I.O.U. Beer to the world. We’ll repost these virtual pats-on-the-back, and also create a people page for anyone that sends a beer. Your people page will show who you owe, and who owes you. The sender or receiver also has the option of “redeeming” an I.O.U. via a direct message to Foamee, completing the deal. I realize this is a silly (but potentially useful) service. And I’m excited to see where it leads, if anywhere. What it does now is incredibly simple (and there’s a reason for that, partially explained below). It’s also a shameless brand vehicle. How so, you ask? Right out of the gate, there are two cool things to buy at the Foamee Store (because two weeks from now, when you’ve long forgotten about this little site, it’d be too late). T-shirts (of course) and I.O.U. 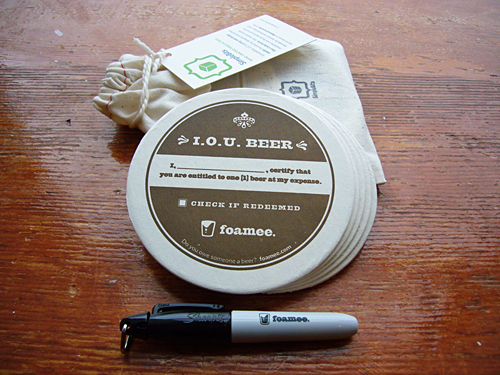 Beer Coasters: a pack of six pulpboard coasters shipped in a drawstring cotton bag with a Foamee-branded Mini Sharpie. The coasters have a spot to write your name, perfect for handing out tactile I.O.U.s in person to deserving recipients. They work great in the mail as well. And they are awesome. Building this little app became a personal challenge. Could I handle the backend as well as the design? Could someone who primarily spends their time worrying about interface solutions roll up their sleeves and create a fully-functional product? And so the process of investigating APIs, databases and frameworks began. It reminded me of the old days, learning HTML (and later CSS) for the first time. Late night experimentation, utter frustration and then those “little victories” that make it all worth it. Foamee runs on PHP, using the CakePHP framework, which turned out quite well. Cake uses the same model/view/controller setup found in Rails and other frameworks, has a good community and is dead simple to install and move around. I owe Jonathan Snook a beer for blogging about Cake (surely where I heard about it first). My code is likely terrible and other smart folks could probably bang out the same functionality in an afternoon, blindfolded and behind-the-back. But it works, and my familiarity with PHP coupled with my experience with Rails while working with the imitable Dan Benjamin on Cork’d and other projects (I owe him several beers as well) made baking with Cake tolerable for a noob like me. Foamee is hosted by the fine folks at Media Temple, and I owe them a beer (or twelve) for that. The motivator here was fun. Fun to build, fun to create for, and (hopefully) fun to use. I’m hoping fun continues to motivate around here — for Foamee and for whatever else cures the constant desire to create. Special thanks to Biz Stone at Twitter for helping tap the keg last night. In doing some research for a newish presentation, I’m on the hunt for cool, funny, well-designed and/or useful custom 404 pages. Stumbled across anyone that gets this right? I’d love to see it. We arrived at the bed & breakfast in the Berkshires and my headache had worsened. Forgot to pack some Advil. Damn. I went in the front door of the inn and an old man asked if I needed help. Well that’s odd, I thought, assuming there was a little store inside — or at least those little individual packets for sale. Must be the owner of the inn. Maybe “she” runs the shop in the lobby. He led me to a large living room where an old woman sat in a chair by the fireplace. “Hmm, lemme see,” she said, as she plunged her left hand deep into her left pants pocket. She must’ve fished around in there for a good 20 seconds. “Ah ha! I found one,” pulling something out. She then carefully tipped her hand so the pill would softly fall into the old man’s palm (so that he could walk over to me and do the same). I looked down at a single white pill in my hand. *U-489* was imprinted on it (or something like that), with no other clue that this was indeed an over-the-counter pain reliever. I clenched my fist around it and said, “Thanks”. “Come prepared!” the old man shouted as I walked down the steps outside, firing the mysterious pill into the bushes. I’ll never leave home without aspirin again. A Type In the Right Direction? We hear news that Webkit now supports the @font-face CSS property, enabling the designer to specify downloadable fonts in their web pages. I can remember getting excited about this back in June after hearing Håkon Lie talk about it during @media London (check out Richard Rutter’s thoughts on this as well). Legal and security issues will prevent us from using most fonts of course, but I like to focus on the positive here. There are some perfectly useable, free fonts out there — and more choice is better than little or no choice, right? Personally, I’m just happy that we’re reaching a point where we’re having this conversation! Right! What’s important, I think, is that this helps move things along. Perhaps it will stoke the fire in terms of a real conversation between type foundries and browsers on how things could work while protecting the font maker. Then again, maybe it won’t. In general, web designers aren’t typographers. Their specialty is in the realms of interface, hierarchy, and navigation. Their training does not include making decisions about what typeface to use for long passages of text. While this certainly could be true for many, it doesn’t mean that web designers can’t become good typographers — especially when given the chance with more of a variety of typefaces to work with. The worry that all web pages will be suddently ruined with crappy free fonts everywhere overshadows the fact that some good can come out of the ability to at least have a choice to use those crappy (and/or potential useful) fonts. Give us all a chance, eh? For instance, and maybe this is fresh on my mind after releasing a *cough* icon-based pixel font *cough* just days ago, but imagine using a downloadble dingbat font for displaying icons instead of GIF or JPEG images. Suddenly text and icons become truly scalable together. Just a small example — but one I’d love to experiment with. I’m pleased to announce a new product shipping today over at the IconShoppe. Chameleon16 is a new pixel font for Mac and Windows, hand-crafted using only the finest pixels available. It’s based on the Chameleon Original icons that we’ve been hocking over here to support our growing latte addiction. Initially, I’d thought to just convert the GIF images to a bitmap font so that the customer could change the color and add effects at will. The minimalist nature of the icons begs of it, and having the 16×16 icons in font format would sure be handy. But while I was at it, why not create new _alphanumeric_ characters to go along with it, and create a real font in the same style? As the name suggests, Chameleon16 is designed to be used at 16px. And like its pixel font predecessors, it also works at multiples of that base (32px, 48px, 64px, etc.) for retro, extra blocky goodness. Since each character is a 16×16 tile, it admittedly has limited use for setting large chunks of text. You’re not going to use this font to display client invoices or proposals. But interesting things can happen when you start playing with kerning and line height, and I’m excited to see some interesting applications where it could be used creatively. The TrueType font includes standard alphanumeric characters as well as the entire Chameleon Original icon set as alternate characters and costs just $39 bucks. 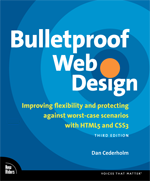 As a special promotion, the first three orders also get a free copy of Bulletproof Web Design, Second Edition that hit store shelves last month First three orders received!. The process of creating the font was a learning experience, and I would compare it (at times) to removing stubborn wallpaper. I first created the characters in Photoshop, then used a program called BitFonter to turn those into a bitmap font, assigning each character, adjusting metrics, etc. Over the course of the last six months or so I began chipping away it, navigating the spotty documentation, and teaching myself the wonders of font metrics, character encoding and more. In the end, I needed to create additional outlines of the bitmap characters and export these into TypeTool which could then generate a proper TrueType file (after having problems letting BitFonter do this). If I knew what I was doing this wouldn’t have taken long. I avoided using something like Fontographer (also by FontLab) because I was creating a bitmap font and BitFonter’s pixel editor seemed a natural choice — and for creating and editing _pixel_ fonts, it’s great (or at least slightly more intuitive). It’s the output and documentation that was confusing, and my respect for _real_ type designers has grown tenfold after this little project. So, my advice for those looking to create their own pixel fonts: learn Fontographer, or remember that you’ll need TypeTool in order to generate a TrueType file from BitFonter’s outlines. Just a quick reminder of next week’s meet-up of the Markup & Style Society. Ethan and I have occasionally put together these informal gatherings in Boston for the past few years. They’re always a good time, and we’re always amazed by the turnouts. So join us next Wednesday the 26th at Boston Beer Works on Canal. The format of these meetings is pretty simple: we meet and enjoy beverages for a few hours. That’s it. Perhaps we need a secret handshake or other ceremonial traditions. Those will evolve in time. We do have plans to expand this a bit in the future, and would love any ideas on a venue around town to hold a more structured meeting. 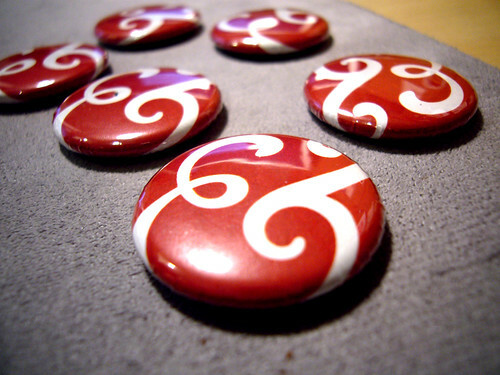 Lastly, there are a few more pinſ available if you don’t have one yet. Hope to see you fellow New Englanders there. I’ve been meaning to write up some thoughts on last week’s “An Event Apart Chicago”:http://aneventapart.com/events/chicago07/. It was my first trip to the city in the middle west that sits on a big lake. Hot dogs were eaten. “Cheezborgers”:http://www.flickr.com/photos/adactio/1255681470/ were inhaled. Deep dish pizza was shoveled. I was inflated. Chicago is without a doubt a food city — but how the heck does anyone stay under 300 lbs. there? The event itself _was excellent_. Of course it was excellent. Whenever you get a bunch of great speakers and cool attendees under one roof for a few days, that’s the way it’s going to go. But there are other reasons why this particular show was a success. In my opinion: one track continues to rule. It rules because you don’t have to decide where to go and what to miss. But it also rules because the conversations in the hallways and pubs can be centered around the same sessions. There’s no “ah, I missed that one because I saw ______ instead”. There’s a complete shared experience between all attendees, and that’s a very good thing. On the opposite end of the spectrum is SXSW, which will have approximately 23,867 panel sessions next year. Maybe we’ll be able to talk about one of them together. Maybe we’ll also bump into each other at that party on Sixth. Or more likely, we’ll leave feeling like we’ve missed the _real_ conference. Another key to the single track at AEA: breaks. And a lot of them. An hour is a long time to sit, and a nice break after every session really helps. It also helps in that it gives more opportunity to chat with people. And you can chat about the session that just happened while it’s fresh. It seems obvious, but not every event is structured like this. I’m bummed I missed “Liz Danzico”:http://bobulate.com/’s The Seven Lies of Information Architecture talk. But I was busy freaking out about my session that immediately followed, going over slides up to the last minute, as usual. “Derek Featherstone”:http://www.boxofchocolates.ca/ wowed us with a “semantically rich crossword puzzle styled with CSS”:http://www.boxofchocolates.ca/projects/crossword/. A highlight was Coudal‘s closing keynote, where he talked about the balance between work that pays the bills and the personal projects that are exciting, fun and if you’re lucky can also pay the bills. A lot of what he was saying hit close to home — the idea that maybe we all don’t have short attention spans. We get inspired and have those moments of sheer excitement when diving into something new. I liked that Jim said this was OK. See the hilarious “aforelinked film”:http://www.simplebits.com/notebook/2007/08/30/regrets.html that supplements this. It was a quick trip, but luckily was able to squeeze in a river boat tour of downtown Chicago with friends old and new. The architecture is incredible, and sitting on a boat floating through the city is my kind of sightseeing. From the river, one can take in the hundreds of skyscrapers that pepper the riverside. Just amazing. Photos were “taken by me”:http://www.flickr.com/photos/simplebitsdan/sets/72157601786721091/ and “by many others”:http://www.flickr.com/groups/aeachicago07/pool/.